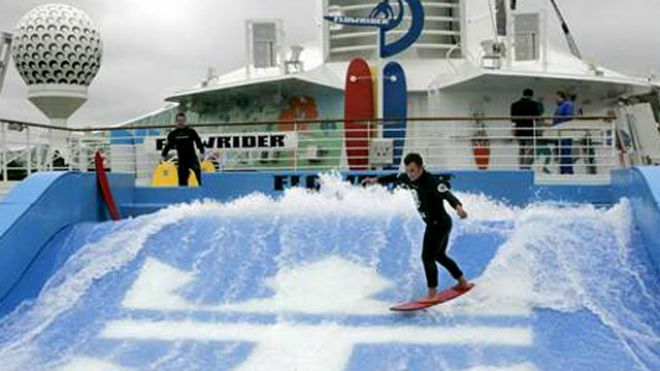 A couple of weeks ago we talked about some of the top cruising trends for 2012. Because we’re such Disney fans, our first though was of course a Disney cruise. However all the big cruise lines have cruises and programs perfect for families with kids of all ages. Back then Disney had a theme park containing a cruise, now it has four cruise ships containing theme parks. Disney is not a cruise line just for kids– it is a cruise line with a well-deserved reputation for family-oriented cruises. But other cruise ships can work just as well, depending on the ages and interests of your family members. As long as there is something for everyone, each can go his or her own way, but never go so far that you can’t regroup for dinner. I personally recommend the following newer and bigger ships for family cruises: All four Disney ships: Royal Caribbean’s Oasis and Allure of the Seas; Carnival Dream, Miracle or Breeze; NCL’s Norwegian Epic. These children’s programs are common on most cruise ships, but these newest and biggest ships have most comprehensive facilities for kids. Professional youth coordinators will entertain them from 8:00 am to midnight with video games, water slides, swimming pools, foosball, board games, puppet shows, karaoke, movies, nap time and more – all at no charge. They will have late-night slumber parties for the school-age kids, or you can even hire a private babysitter to stay with younger kids until well past midnight. So we still haven’t decided on a cruise for our next vacation – or just a beach to chillax somewhere in the Caribbean? Any advice?